Conservation workers are trying to re-establish a Hihi population back on the mainland – one project being in the Cascades Kauri Park, Waitakere ranges. Over 120 birds have been released in the Cascades Park. They had been reared on predator free islands in the Hauraki Gulf. However introduced predators in the mainland bush keep the population from thriving. So stoats and rats must be killed off to be kind to the bird inhabitants. Volunteer conservation workers visit established trap lines regularly to renew baits and clear kills. Re-establishing populations of the original inhabitants is important for New Zealand bush eco-system as there is a relationship between the animals and trees – Birds distribute seeds, spread fertiliser, and help pollination. 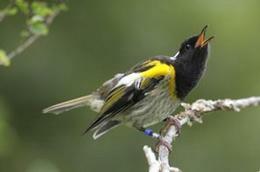 The Hihi’s strident call is distinctive, likened to the word “stich” or two stones being repeatedly struck together. They also have a low warbling song that can last several minutes. Hihi nest in tree cavities (which may make them more vulnerable to predators) and have an unusual mating system in which females may breed with a single male or several. They are the only bird known to sometimes mate face to face. Enlightening comments from Buddhists welcome.